Arches National Park is one of the most amazing places to visit in the United States. The entrance to the park is located in the little town of Moab which is about a half hour south of Interstate 70, between Grand Junction Colorado and Richfield Utah. Moab is a mecca for bicyclists, rock climbers and hikers from all over the world. 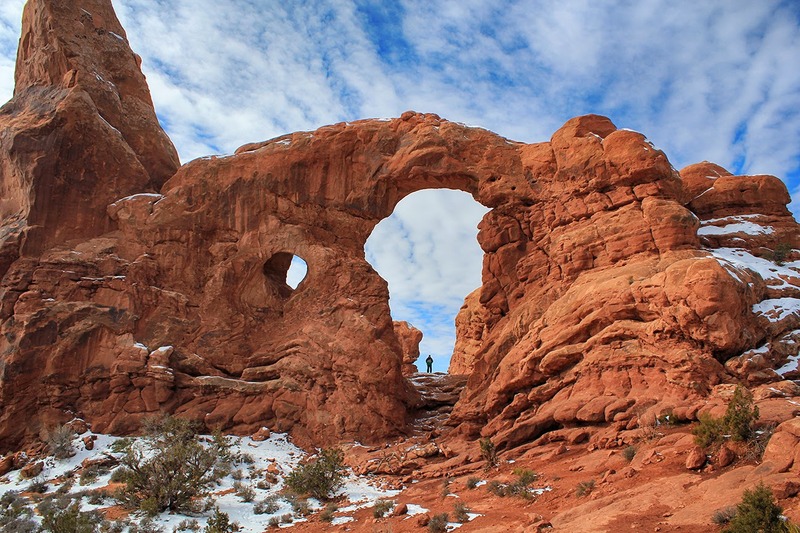 According to the National Park Service website, Arches National Park contains over 2,000 arches. I was only able to spend a single day in the park. I hiked approximately 8 miles total, covering 4 of the most popular hikes in the park. I easily could have spent a whole week in the park just taking photos. My favorite section of the park is known as the ‘Windows Section’. It contains a few of the largest and most impressive arches, the North and South Windows and the Turret Arch. These arches are located just a few hundred yards uphill from the parking area. They are accessible for small children and anyone who is physically capable of climbing a few dozen stairs. If you only had an hour or two to spend in the park, this is the hike that you would want to do. The best hike we did in Arches National Park was definitely the trek to Delicate Arch. 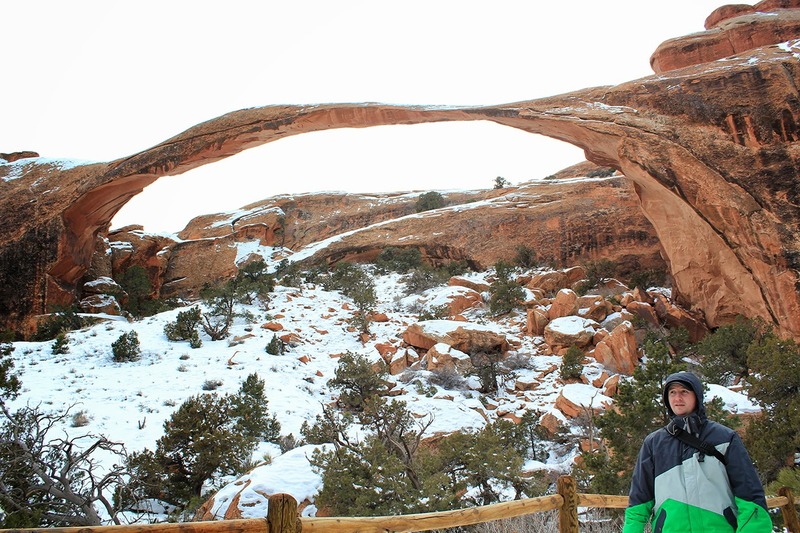 This is the arch prominently featured on Utah’s license plate. The hike is approximately 3 miles round-trip from the parking area at Wolfe Ranch, but it feels longer because most of it is uphill and the air is very thin when you’re at 6,000 feet above sea level. One section of this hike involves navigating up a large rock dome. There are rock cairns placed strategically along the way to help mark the trail, but we noticed several people getting lost and heading in the wrong direction. Just follow the cairns and you will be fine. The reward is definitely worth the effort. 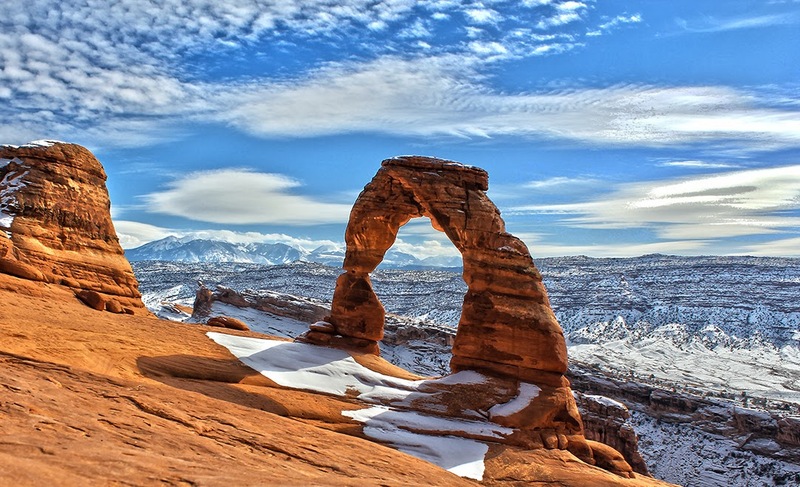 Delicate Arch is one of the most awe-inspiring natural wonders in any of the national parks. Our final hike of the day was to see the Landscape Arch located in the ‘Devil’s Garden’ section of Arches National Park. The hike to Landscape Arch is approximately 2 miles round-trip with only a very slight elevation gain. This hike should be suitable for even young children. 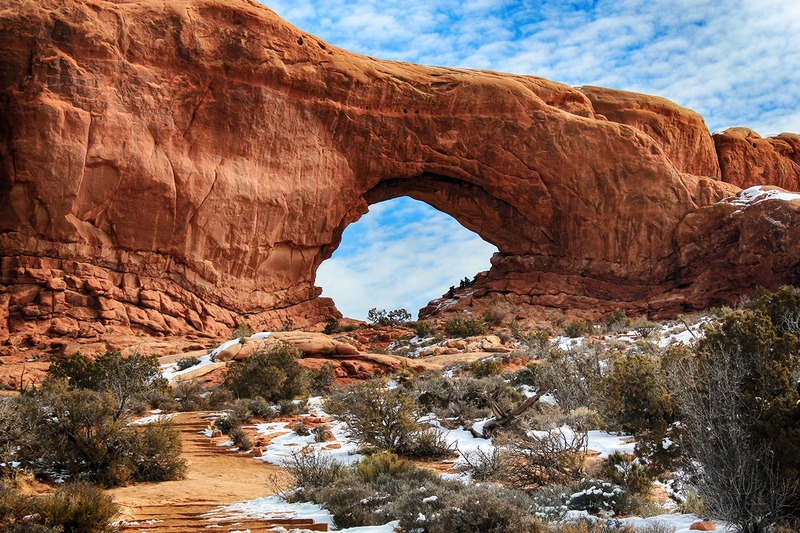 There are literally dozens of arches located just off the trail in the Devil’s Garden. This is also the section of the park where the campground is located. I’m sure this is a very busy campground because it was half full during a mid-week in the middle of winter. The weather in the area of Utah varies a great deal, from scorching summers to brutally cold winters. I would highly recommend visiting this park in the spring or fall, especially if you plan on camping. The summers here are especially hard for hiking under the cloudless sky in the 100 degree heat. You would need almost a gallon of water per person for an 8 mile hike in the summer. The off-season hotels in Moab are very reasonably priced. We saw multiple places for 40$/per night on Travelocity.